What better way to start the year with some exercise and quality time in nature - let's go on a 2. Protected content hike on the scenic Southern Ridges route, starting at the Alexandra Arch. We will meet at Protected content We will follow the route that will take us through the Singing Forest, Forest Walk, Alkaff Mansion, Sembcorp Forest of Giants, Henderson Waves, Faber Walk Marang Trail and finally Vivocity. There we shall change, and proceed to dinner at Protected content and have its famed Samsui Chicken. As we probably need to make reservations, please confirm your attendance latest 2 days before the event. "A seamless expanse of green open spaces, the Southern Ridges is a 10-km trail that offers a unique outdoor experience in the southwest of Singapore. 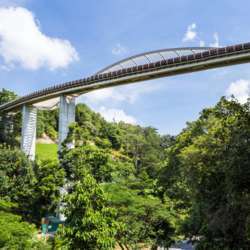 From the many architecturally striking bridges and walkways, trekkers can enjoy a panoramic view of the verdant greenery in the three parks and one nature reserve that make up the Southern Ridges – the lush hilly parks of Mount Faber, Telok Blangah Hill and Kent Ridge, and the rich flora and fauna of Labrador Nature Reserve. Replace the sounds of the hustle and bustle of city life with the symphony of insects and birds, and explore one of Singapore’s most exciting recreational destinations." Any queries, suggestions, feel free to message me.